You have to applaud Ford for reintroducing a junior-size companion to the F-150, but at the same time you have to wonder why the automaker abandoned the segment in the first place. While the retirement of the previous Ranger following the 2011 model year was long overdue, it was surprising that there was no replacement planned. That left anyone seeking a less-than-full-size pickup to ponder the Chevrolet Colorado, GMC Canyon, Toyota Tacoma, Nissan Pathfinder and the Honda Ridgeline. Ford seemingly took its time to consider its options — keep the next-generation Ranger as a compact pickup, or move up into midsize territory — and it wisely chose the latter. That decision was likely made easier since Ford already sells the Ranger in many other countries, which provided a ready-made template for North America. Still, the new Ranger is significantly smaller than the F-150 (about 28 centimetres narrower). The new Michigan-built model, which went on sale at the end of 2018, is similar in design to its global relations. That means it projects a degree of stylish ruggedness, whether it’s the extended SuperCab version with two smaller rear-hinged openings, or the four-door SuperCrew. A regular-cab Ranger isn’t in the plan. The SuperCab comes with a six-foot box, while the SuperCrew’s bed is five feet. Unlike the F-150, which has an aluminum body, the Ranger only has an aluminum hood and tailgate. For North America, Ford beefed up the boxed-ladder-type frame/chassis for increased sturdiness and cargo/towing capacities. As a result, the Ranger’s maximum payload tops out at 845 kilograms, while you can trailer up to 3,410 kilograms. By comparison, the Chevrolet Colorado’s payload/trailer numbers are 715/3,500. While GM’s midsize offerings can be had with a turbo-diesel option, the Ranger is only available — for now — with a turbocharged 2.3-litre gasoline four-cylinder that delivers 270 horsepower and 310 pound-feet of torque. It’s much like the engine found in the sporty Mustang and the Explorer utility vehicle, but in the Ranger it makes a bit less horsepower and identical peak torque numbers. A 10-speed automatic is your only transmission choice, as is a dual-range shift-on-the-fly four-wheel-drive system that’s standard for Rangers sold in Canada. There’s nothing tricky or overly dramatic about the Ranger’s cabin, just straightforward gauges and large, clearly marked dials for the audio and drive-mode controls. The centre stack has a 20-centimetre touchscreen. Ranger pricing starts at $33,100 (including destination charges) for the base XL SuperCab. Add an extra $6,400 for the XLT SuperCrew body style. 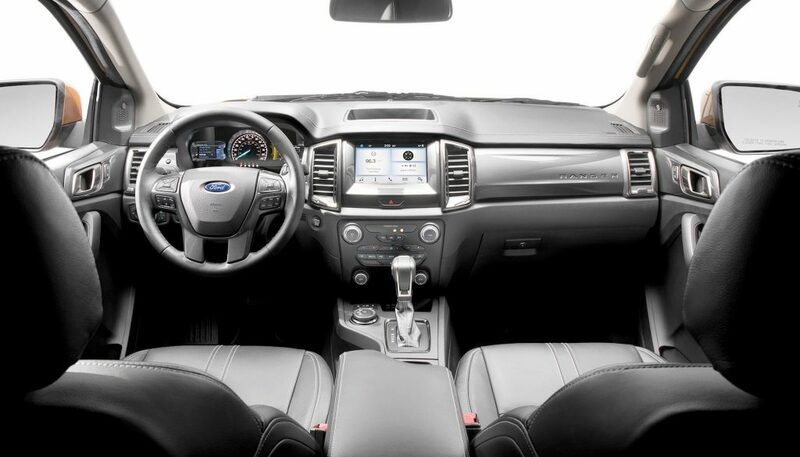 The midrange XLT and top-end Lariat arrive dressed up with plenty of luxury amenities. 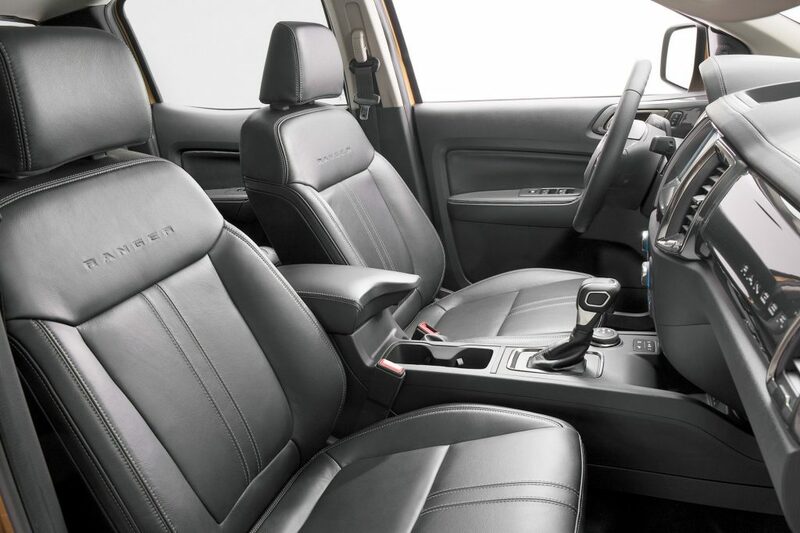 There are premium-leather interiors, up-level audio packages and larger and fancier wheels, depending on the trim. Both come with Ford’s Co-Pilot360 suite of dynamic-safety tech designed to keep you and the Ranger out of harm’s way. For venturing off the proverbial beaten path, the available FX4 off-road package has specially tuned shocks, off-road rubber, locking rear differential and protective skid plates for the transmission, steering rack, transfer case and fuel tank. Also included is a Terrain Management System with four modes: Normal; Grass, Gravel and Snow; Mud and Ruts; and Sand. Additionally, Trail Control limits the Ranger’s speed when heading down a steep slope. It works in both high and low 4×4 ranges and in any of the Terrain Management System settings. 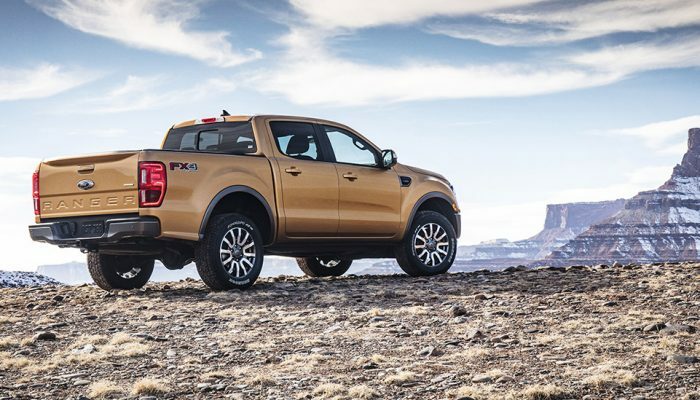 With news that a Ranger Raptor will not be available in North America, the FX4 option is likely to be the most capable off-roader in the lineup. Except for certain carrying and towing situations, the smaller and less-costly Ranger will satisfy most trucking needs just as well as the pricier full-size F-150. The best part is that midsize-truck shoppers no longer have to leave the Ford brand to go smaller. Market position: Ford has been away from the small-size pickup class for the past seven model years and has some catching up to do with General Motors, Toyota and Honda now dominating the category. Points: Attractive styling should stimulate buyers • Conservative, uncomplicated dashboard and controls. • Standard turbocharged four-cylinder engine has enough power and torque for most applications. • No standard active-safety tech? • Ford should reconsider a Raptor version of the Ranger for North America. L/100 km (city/hwy) 11.8/9.8; Base price (incl. destination) $33,100. Midsize companion to the GMC Canyon has an attractive bare-bones price. Popular, but pricey pickup offers both I-4 and V-6 engines with up to 278 h.p. Well-equipped model has plenty of passenger/cargo room and a 280-h.p. V-6.